Since Gavin's game of WalletCard swept the blogsphere, I can think of a couple guys that give fairly regular updates on where their card shows up - Bo's card of Donny Baseball makes appearances all over the city of New York, while the Junior Junkie's Upper Deck card #1 of the Kid hits parades, restaurants, farms and other locales. For me, WalletCard Robin mostly makes appearances on my Twitter page. In fact, except one posting, I believe, I have never shown many shots of my card out and about. Well, I just got back from a visit to my daughter in the Upper Peninsula and a shot a few pictures with Robin, so I thought I would got back in my camera and pull out some images over the past few months. 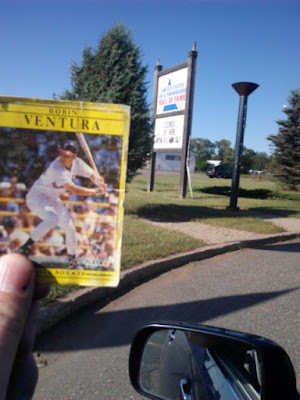 It's not that I don't have cards to share, but I am worn out from the 7 hour drive to think straight. 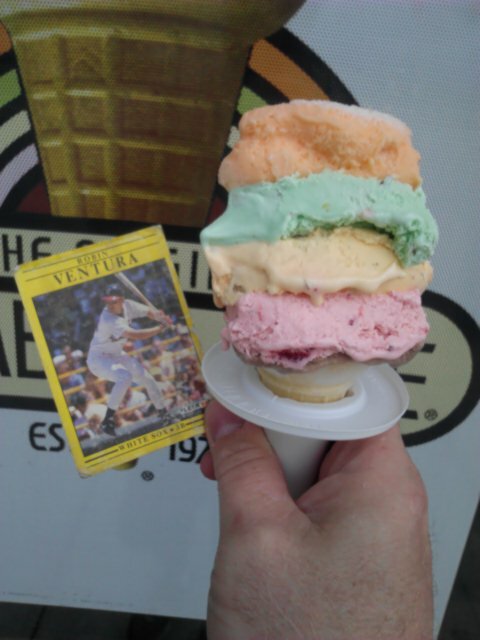 If you are coming in for the National, and can handle a drive about an hour south of the convention, I highly recommend a Rainbow Cone at the Original Rainbow Cone. Anyone from the south side knows it, and has been there. I'm holding it at a bit of a bad angle - you can't see the bottom flavor. A Rainbow Cone starts with chocolate, then you get strawberry, Palmer House (vanilla with walnuts and cherries), pistachio and finally orange sherbet. It's the best ice cream cone in the world, and everyone should have one in their lifetime. This was Robin's first. He's hooked. 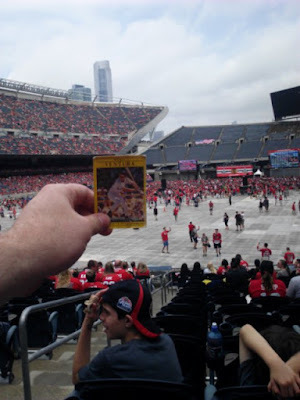 With all the rain we were getting here in the Chicago area, the championship rally for the Hawks 2015 Cup win was moved from Grant Park, where an estimated 2 million showed up in 2013, to Soldier Field. A limited amount of free tickets (65k) were available and I lucked out. Somewhere in the background of that image is the Holy Grail. They don't build them like they used to. In Downers Grove, about 40 min from my house, is a gorgeous 2nd run theater - the Tivoli. 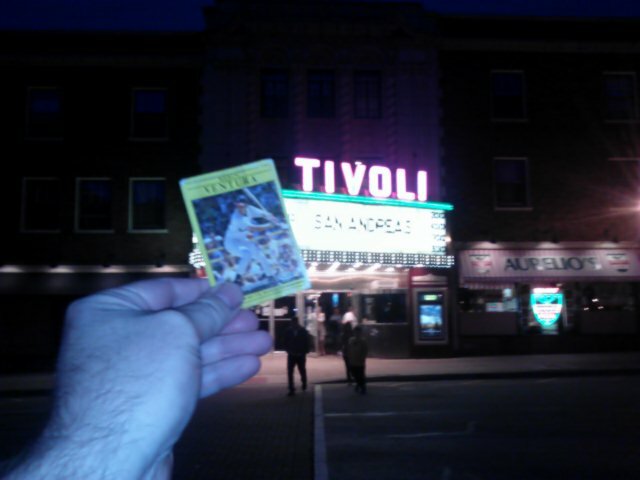 It happens to be the 2nd theater in America built expressly for talkies. It was renovated years ago, and it's straight up gorgeous inside. On Friday and Saturday nights, they play live organ music before the show. Here's a look at the facade in the daylight. 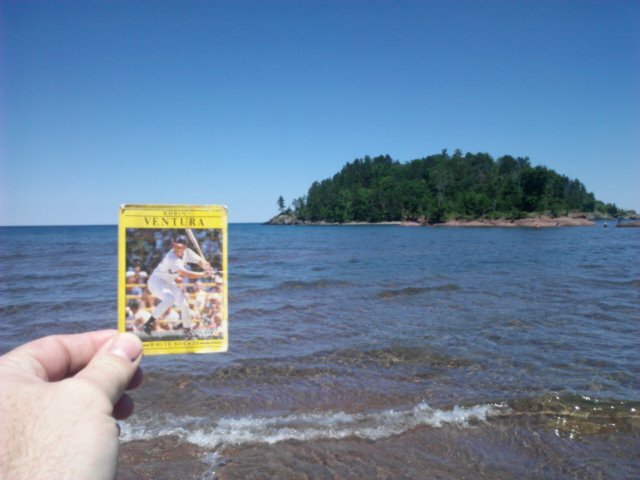 That is Lake Superior, and a small island just off the cost. I want to say it's Peacock Island, but I don't think that is accurate. When the lake freezes over in winter, you can walk over. Which my daughter tells me the deer do, and get stuck when it thaws. You can also walk a sand bar to the island. I was in no mood to get wet, so Robin and I stayed on the beach. Ishpeming, MI is considered the birthplace of skiing in the US, so it should be expected to be the home of the US Ski and Snowboard Hall of Fame. I didn't have time to go in, though admission is free. I will have to check it out, cuz if I love anything, "free" in the title makes me love it even more. That's the sign out front, but the sunlight makes it hard to read. 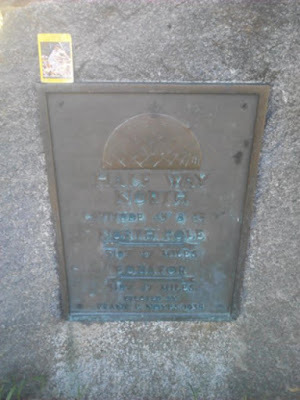 Last image from the trip was Robin hanging out at a monument for the 45th Parallel north. The marker signifies the center line between the north pole and the equator. We were on Route 41, about 105 miles east of one of the four 45x90 points on the globe. Still, I like this. Anytime I drive, if I see a sign that reads historical marker or geographic marker, I'm pulling over. Call me Clark Griswald. Ok - so that's the recent travels of WalletCard Robin. I leave you with one final image. I couldn't get Robin in on the shot, as we were traveling 70+ MPH on the expressway in Indiana about 3 weeks ago. But when you see something like this, you take out your phone and you snap a picture. Oh man that banana car is unreal. If you had gotten your nice yellow '91 Fleer into the shot that would have been pretty close to an unbeatable wallet card photo! 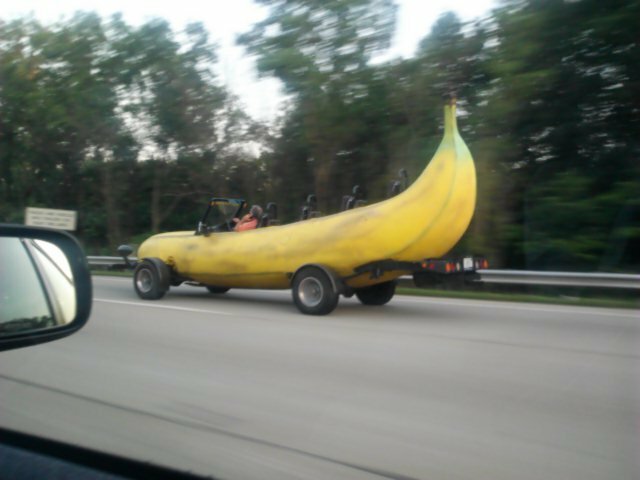 Banana car looks like a legit banana. Good on 'em.